It’s time to start thinking about fun ways to keep the little (and big) ones entertained without having to spend big bucks. Whether its spooky Halloween party fun, or something to keep the kids entertained on a rainy day, University Games has a few great board games that can really help those rainy, or cold days, go with a lot more fun. There really is nothing that can beat something like this – and there really IS nothing like Googly Eyes! 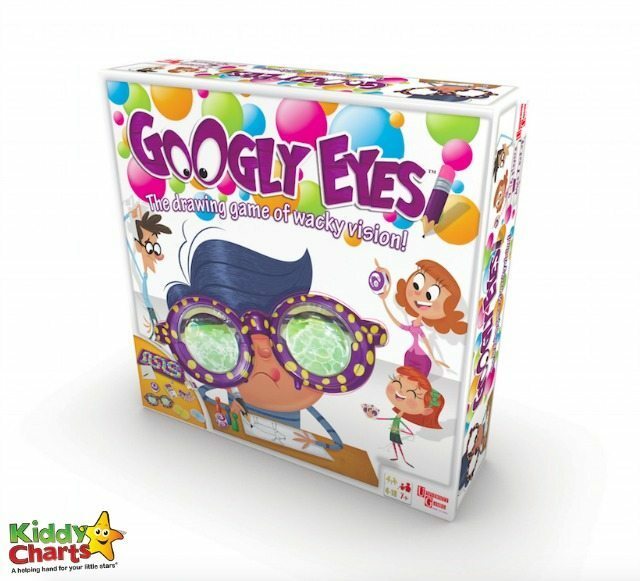 Googly Eyes, the hilarious drawing game involving crazy, googly glasses that challenge your vision and leave you googling for more. Simply put on the zany, vision-altering Googly Eye glasses and start to draw whilst the team tries to guess what you’re drawing – and on a time limit! Googly Eyes is perfect for the whole family and the zany, googly glasses are great for picture opportunities and Halloween silliness. However, the game isn’t just for Halloween, there is a lot of fun to be had with this, anytime of the year. As usual, just fill out this widget and you are away. You can also share your entry, and if your friends enter, you will get THREE more entry points too. We wish you all good luck, and hope to see you on the blog again soon. We’ve always got something new and exciting every week for you all. Thursdays is our usual day for giveaways, but we do like to thrown in a few more once in a while. Spot the difference – My 7 year old is just getting into these. Bunny Jump, it looks a lot of fun. The Pointless game looks great. It’s our favourite game show. Word has it looks really fun! I love games that encourage spelling! Seagull Splat sounds appealing. The children like anything with words like splat and goo in them. The boys love seagull splat -anything remotely to do with bodily functions has to be hilarious, clearly! Pointless because I love the show! Bunny jump looks fantastic. I have seen it advertised on tv. Chicken charades as we all love playing the normal version but this seems like a fun twist! It would be Pointless at we watch it as a family & are always trying to beat each other! The Pointless Game looks like a game that would go down well in our house! YETI IN MY SPAGHETTI looks great fun!!! The Pointless game, looks great for all the family and we love the Tv show! 5 SECOND RULE MINI GAME because it looks fun. I like Bunny Jump, a fun game for all the family including younger children. I like it because it does not require any special skill or knowledge so everyone can feel equally included and the theme will appeal to younger players. Seagull Splat would definitley be a winner with my girls. They seem to be going through the everything to do with poo is funny. Pointless, we love watching that as a family, even if we very, very rarely get a pointless answer! Seagull Splat – my son would find this funny! YETI IN MY SPAGHETTI- This game looks really easy to set up and it’s a game which all ages can enjoy! Bunny Jumps looks like a lot of fun and lots of surprises/frights to be had when he does jump. My daughter would love it I bet. Seagull Splat looks like a very fun game. Don’t rock the boat looks silly enough to amuse my nephew. Seagull Splat looks so funny and I love seagulls. Pointless because it is a great game that gets you thinking. Like the look of Chicken Charades. We love playing charades in our house and the rubber chicken element would add an extra bit of fun! Pointless as family game but adults will recognise to. 5 second rule looks like a fun family game! UFO Alarm sounds like wonderful fun with spaceships Aliens, and trap doors. SeaGull Splat would appeal to my kids as we live right beside the sea, and especially during the Summer, when there are lots of seagulls about, we do have to often dodge the splats!